I am discovering that one of the necessary pains of downsizing a home is parting with old friends in the forms of books and magazines. 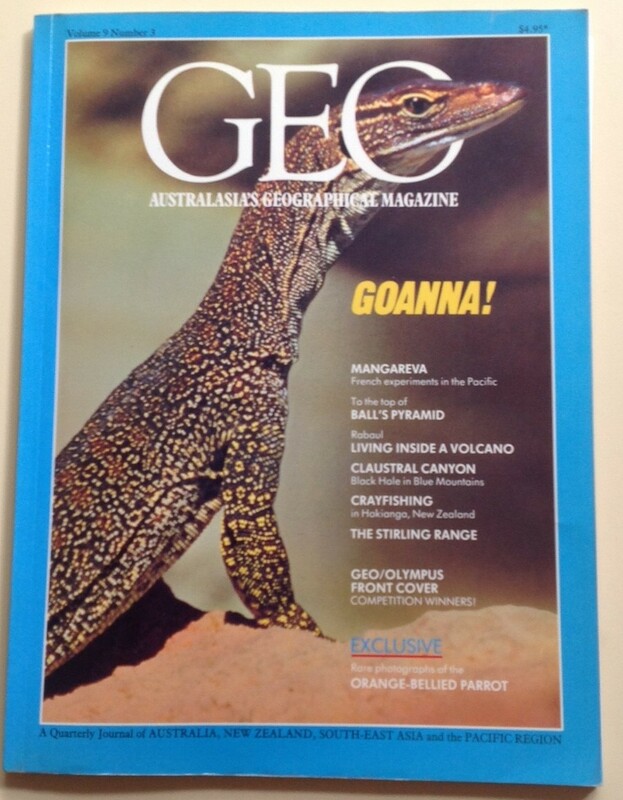 I collected most of the editions of Geo: Australasia’s Geographical Magazine until publication ceased 20 or so years ago. I kept them because of the quality and interest of their stories and pictures and because they featured content about nature. Just when I was resigning myself to sending my collection for re-cycling, I showed some copies to a pastoral care worker caring for patients suffering from advanced dementia. To my delight, she offered to take some copies in order to trial their use with her clients. As she explained, a big part of dementia care is helping sufferers find pleasure and meaning in reconnecting with lifetime memories. Music is very valuable in this connection, for example. Her thought was that articles and photos in Geo might trigger memories of holidays, places visited and experiences with wildlife. A day or two after she took the copies, she reported back to me rather excitedly. She told me how browsing Geo articles together had built a conversational bridge between a son and his dementia burdened father. Typically the son found communicating with his father about immediate day-to-day topics very difficult. But sharing the articles brought a very welcome transformation. The articles triggered memories in the father of his trips to some of Australia’s iconic natural wonders such at Kakadu National Park. He was able to talk about these trips not only lucidly but informatively. The son was surprised to learn things he didn’t know about his dad’s earlier life. Both the memories and the conversation brought precious moments of pleasure and significance to the two men. Happy memories – those that combine joy, satisfaction and a sense of fulfilment – are indeed precious. Like cherished books and magazines, they can be returned to again and again, evoking the same welcome feelings and thoughts over and over again. This is true for happy memories of all kinds, including, and perhaps especially, memories of nature experiences. Sixty years ago we went to Mosquito Creek and saw the most striking explosion of colour I have ever seen among eucalypts. There was this circular carpet of white bush-heather, guarded by magnificent tumble-down gums with their trunks splashed with all manner of browns and yellows, whites and greys; wattles in yellow also stood around the circle their yellow blossom threaded by a purple vine; beauty that was unforgettable. Bob was nearing his 90th birthday when he shared these thoughts and, as he says, the experience he was recalling occurred 60 years earlier. Nevertheless, the detail and vividness of his recollections are amazing. Such is the power of images of natural beauty pleasure to endure in memory and to have a life-long impact. And it is not only images drawn from nature that are stored in memory for a lifetime. When psychological researcher, Rachael Sebba, asked people to nominate their favourite places from childhood, almost all recalled a natural setting – very often because of the fun things they did there. The adults’ happy memories were mainly of the things that nature permitted them to do – to have “adventures”, for example, to meet challenges, and to socialise with friends. Recreational activities in nature are particularly memorable because they are enjoyable in a way that provides a deep sense of satisfaction and fulfilment. I have to admit, that I did not let all my copies of Geo go. Those that had content relating to my own experiences I kept – expressly to evoke memories. 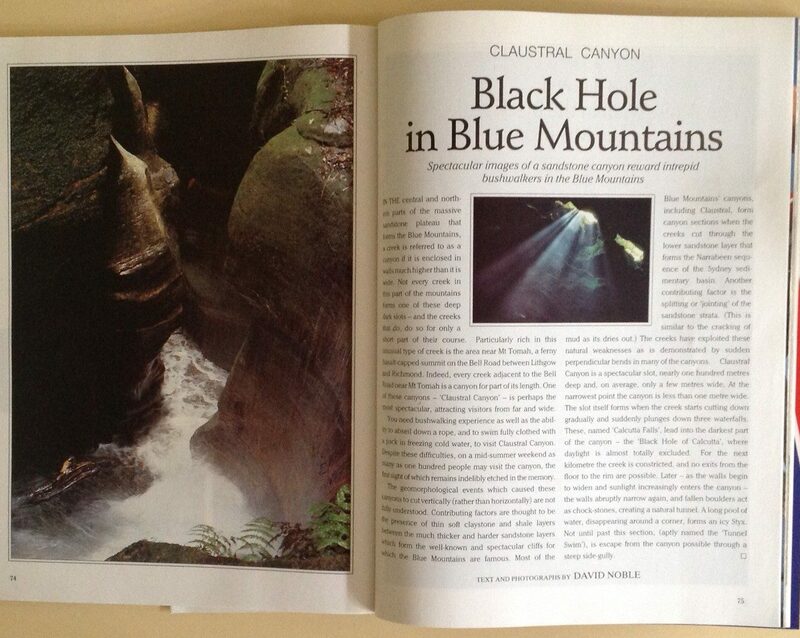 An article about Claustral Canyon in the Blue Mountains, for example, takes me back to one of the most exciting nature experiences – abseiling, water-jumping, swimming and wading – I have ever had. This is one of countless memories I am able to draw from my virtually lifelong connection with nature. Not all of these memories have to do with activities and “adventures”. Many, like the one Bob recalled, are of the beauty and wonder of nature. Bringing these memories to mind is not simply a case of conjuring up dates, times and places. It is much more than that. I reconstruct the experiences in some of their sensory and emotional detail; I relive them to some degree – from the inside so to speak. I become a time traveller escaping the “now”. This sort of memory is known as “autobiographical memory” because it is about the narrative we make from the happenings in our lives. It is important to emphasise that autobiographical memories are rarely, if ever, exact representations of these happenings. They are always mental reconstructions that are influenced not only by the “facts” of the happenings but also by a host of other factors related to our continuing efforts to make the best (for us) sense of the facts. A memory is less an accurate and permanent record and more a story that is constantly being subtly condensed and re-shaped in the telling. Nevertheless, it is entirely appropriate to cherish our happy, autobiographical memories. They help us to know, appreciate and value ourselves as persons. My own autobiographical memories are, of course, sourced from more area of my life than my connection with nature alone. But my sense of who I am is vastly enriched by the memories I draw from that connection. An amazing thing about these memories is the relative convenience and reliability with which I was able to collect them. I have found that nature can be relied upon to provide a never-ending flow, and remarkable variety, of enduringly memorable experiences. Believe me, nature is a truly wonderful maker of memories.